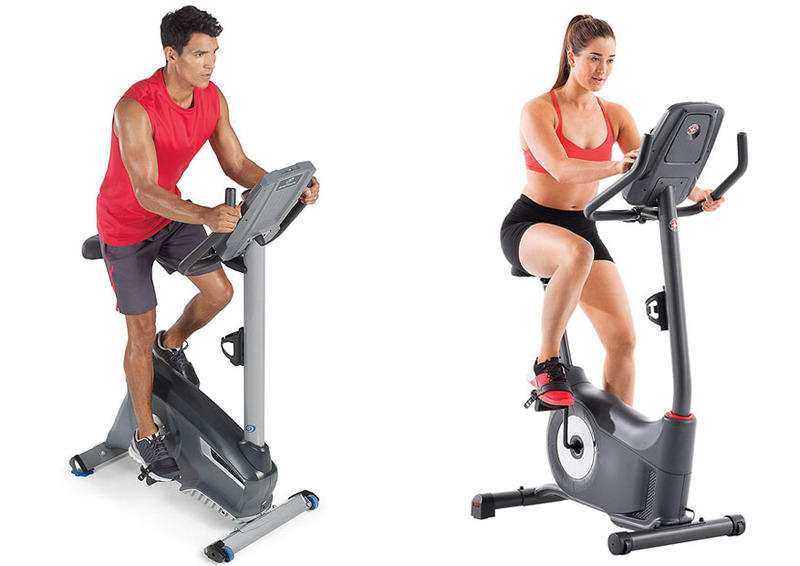 Nautilus U614 vs Schwinn 130 are two upright bikes that are available in a similar price range. Both models are popular in homes. They are suitable options when you want to be able to train without going outside. So, what are the differences between these two models? Which one is better? Find out below! Let’s start by comparing the physical dimensions of these upright bikes. When you are looking for a machine for home use, you have to double-check the dimensions in order to make sure that it will actually fit in your home. Otherwise, if the unit is too large for the available space, you won’t be able to use it. See also: Nautilus U614 vs U616. Nautilus U614 is the slightly larger and heavier model of the two. Even so, note that the differences are not huge. This model measures 41.8 inches long, 21.6 inches wide, and 57.6 inches tall. However, the extra height can be beneficial for tall users. It weighs approximately 68.1 lbs. It has a pair of wheels to allow easy mobility. Schwinn 130 is a little bit smaller and lighter. This model measures 41.3 inches long, 21.4 inches wide, and 55.6 inches tall. The weight is about 58.4 lbs. So, this model may be a slightly better choice if the available space in your home is really limited. The slightly lower height makes it ideal for people with short physicality. It also has a pair of wheels for easy mobility. In general, both Nautilus U614 vs Schwinn 130 have excellent build quality. They both have highly sturdy and durable frames. They both are suitable for users of up to 300 lbs. Nautilus U614 has a thick metallic frame which seems to be incredibly tough and rugged, The pedals also feel solid and durable. The seat is padded and contoured for comfort, and the padding holds up well. Some people find that the seat is not comfortable enough, so they add a gel cover to it. The seat position and the handlebar are adjustable. The flywheel is stable and consistent. 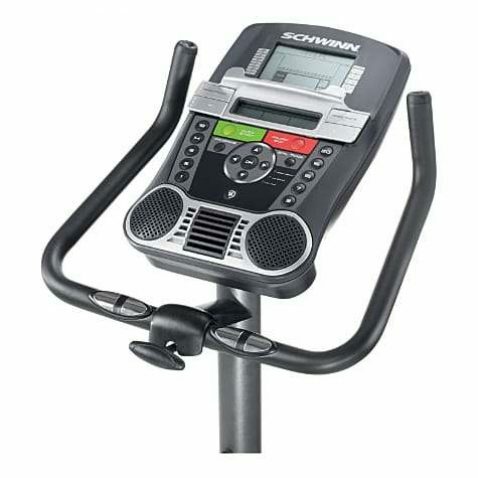 Schwinn 130 has front and rear metallic bars that are more skewed than the ones in Nautilus U614’s design. Even so, the frame remains tough and sturdy, and it does have the same maximum user weight limit, so you don’t need to worry about the durability. This model also has a padded, contoured seat, but some people also find it uncomfortable and decide to add a gel cover to it. The one-piece cranks are durable, and the handlebars are adjustable. Nautilus U614 vs Schwinn 130 share many similar features. First of all, they both have DualTrack consoles. This console features two display screens for showing your workout data. This console allows you to get a full grasp of the information quickly, and it also allows you to adjust settings and workout programs easily. Unfortunately, both of the two models don’t have backlit display screens. Both models have adjustable three-speed fans. Both of them have built-in speakers with audio input ports for playing your favorite music. They also have media trays where you can put your smartphone, MP3 player, tablet, or magazine, as well as water bottle holders that are definitely very handy for keeping you properly hydrated throughout the workout. Both models have built-in heart rate monitoring through the contact sensors in their handlebars. They can’t work with external chest-strap heart rate sensors. Their heart rate sensors are pretty accurate, although not as reliable as external heart rate sensors. Interestingly, Nautilus U614 and Schwinn 130 also come with similar workout programs. 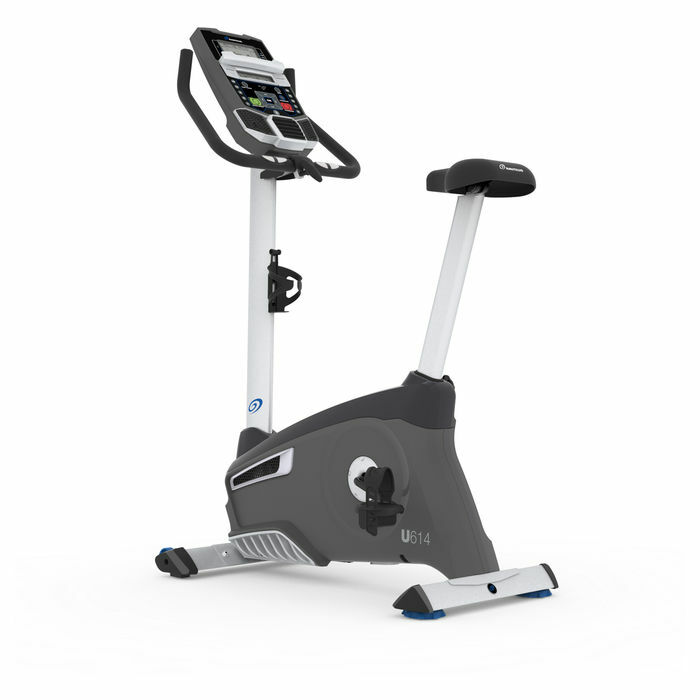 Each of the two upright bikes has a total of 22 built-in workout programs, which include 8 heart rate programs, 9 profile programs, 2 fitness test programs, 2 custom programs, and 1 quick start program. They are capable of tracking a wide range of data, such as the speed, distance, time, heart rate, heart rate zone, level, intensity, revolutions per minute, and caloric count. Performance-wise, Nautilus U614 and Schwinn 130 are quite similar. After all, they use similar mechanics and parts. Each of them uses a high-speed high-inertia drive system that ensures smooth performance. They also use a perimeter-weighted flywheel that delivers smooth, stable, and consistent workouts. When transitioning between different resistance levels, they don’t make any disturbing noise. Each of the two models has 20 eddy current brake resistance levels. In other words, there is a wide range of workout intensity levels available. It is great for casual home users, as well as dedicated fitness enthusiasts and bikers who want to train with heavier challenges. Perhaps the only weakness of these models is the heart rate monitoring. To be fair, their heart rate sensors are as accurate as contact grip sensors can be. They are often quite close to the real heart rate levels. But chest-strap sensors are more accurate and often give closer values to the actual levels. Nautilus U614 has a decent warranty. The frame is covered for 10 years. However, the other physical parts are only covered for 2 years, and the electrical parts are only covered for 1 year. The labor and assembly is covered for 90 days since the purchase date. Schwinn 130 has a similar warranty. It also covers the frame for 10 years, but the mechanical parts are only covered for 2 years and the electrical parts are only covered for 1 year. The labor and assembly is covered for 90 days, too. These two upright bikes share lots of similarities. They are even similar in terms of features, performance, and warranty. However, Nautilus U614 is more recommended in the end because it has an adjustable seat, in addition to the adjustable handlebar. So, it can fit you better and give a more comfortable seat position.